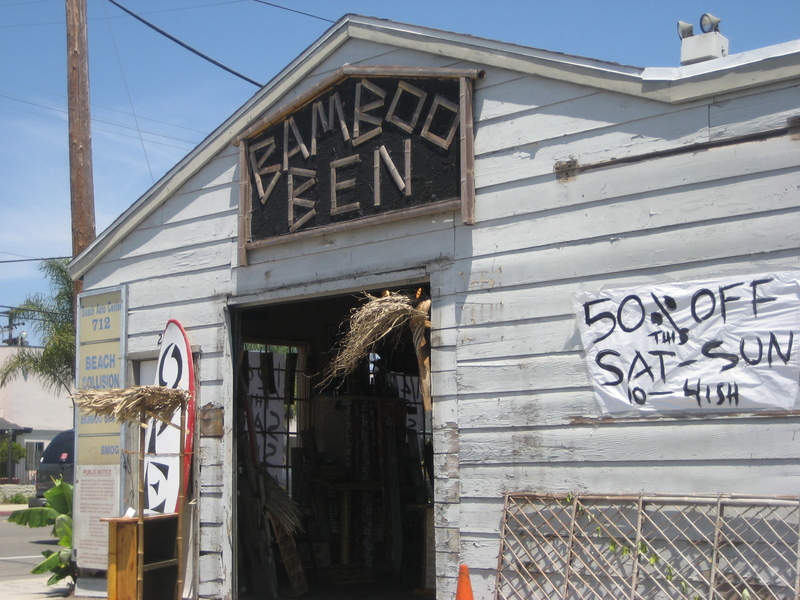 Back in August, Mr. Hockey and I headed down to Huntington Beach to visit the “hut” of Bamboo Ben, the man behind the look of such spots as Forbidden Island, Tucson’s Kon Tiki, the Tonga Lei Room, and Tiki No. 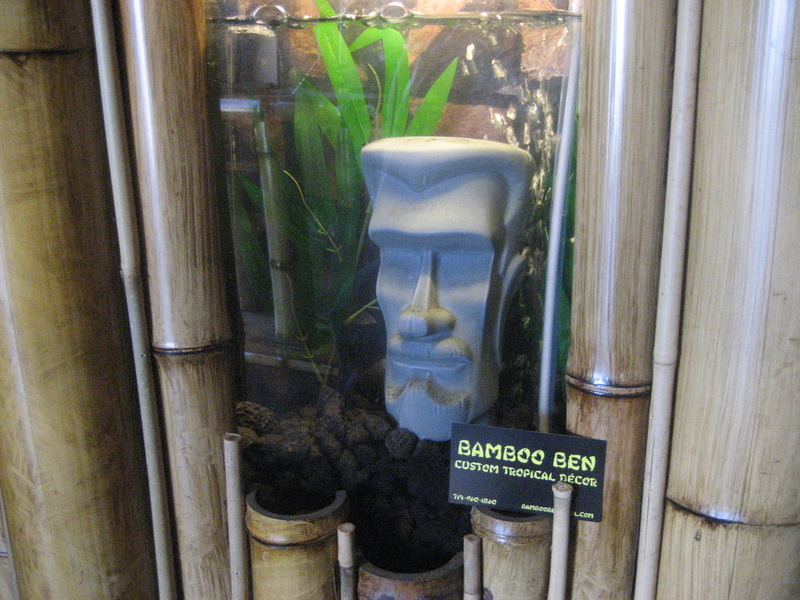 He also happens to be the grandson of Eli Hedley, an originator of the “beachcomber” style (using found objects like driftwood) who worked on tiki heyday spots like the Aku Aku in Las Vegas, the original Luau in Beverly Hills and even Disneyland’s Adventureland. 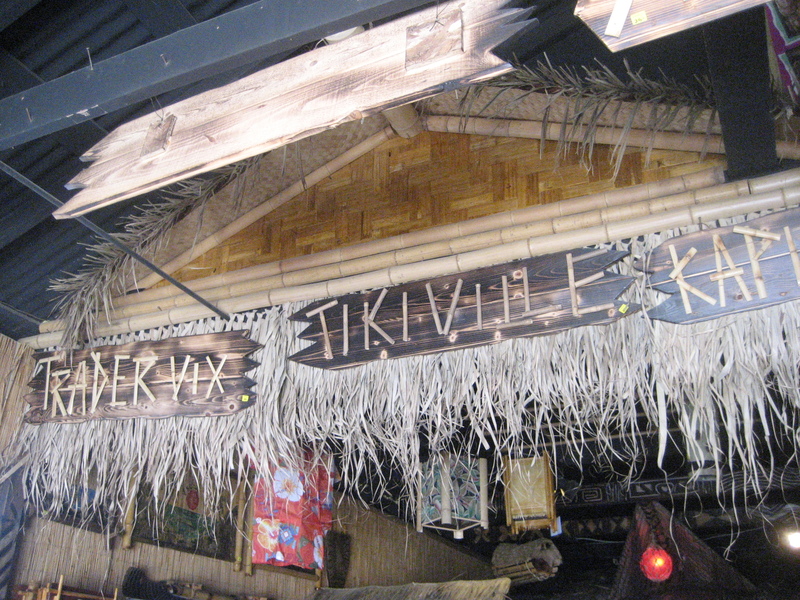 It was sort of like getting to see Santa’s workshop—but tiki! This was a bittersweet day, though, because Ben was leaving the space after 10 years. They were already in the process of moving out, but you can still get an idea of how neat it was with its A-frame peak, thatch overhang and fish float lamp. 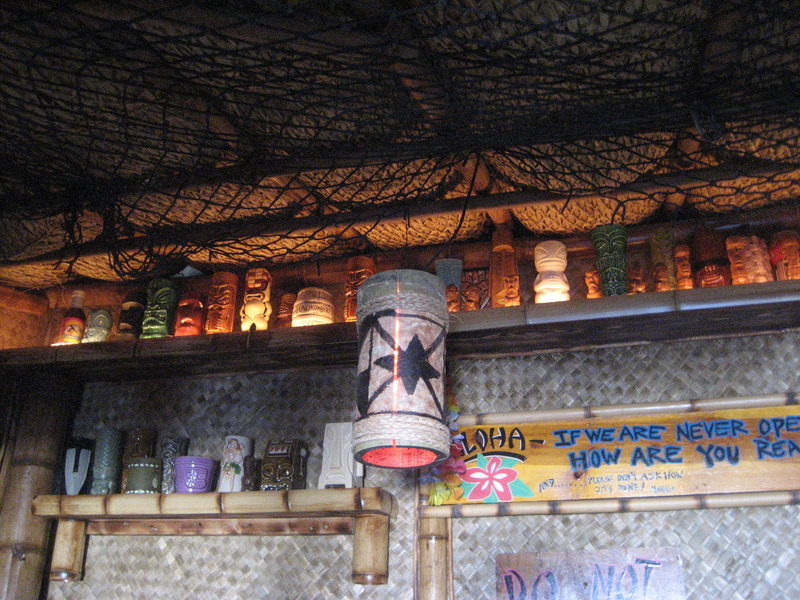 Lining the back of the wall were a bunch of tiki mugs, including trophies from still more places Bamboo Ben’s had a hand in, like Don the Beachcomber, with a lower shelf practically devoted to Frankie’s Tiki Room in Las Vegas. 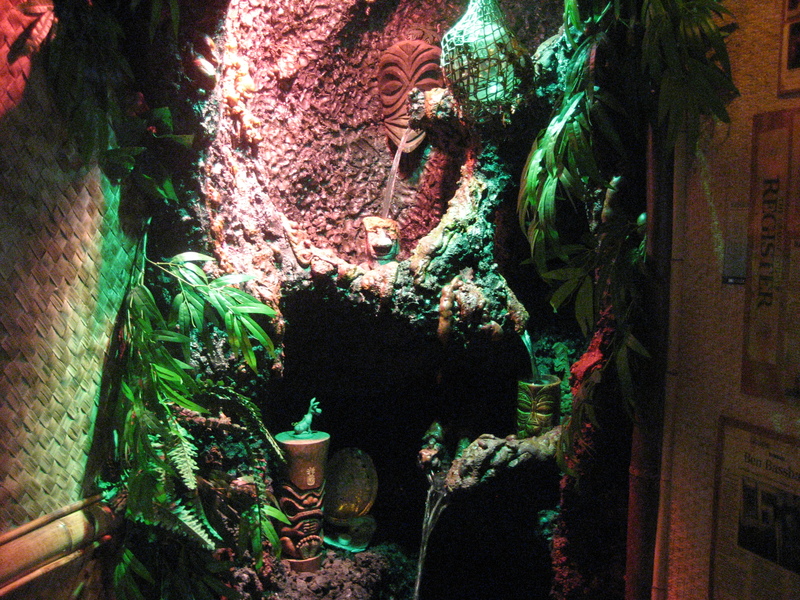 In the corner there was a cool lava rock-style fountain with very ambient lighting and a couple tiki mugs helping to direct the water flow. 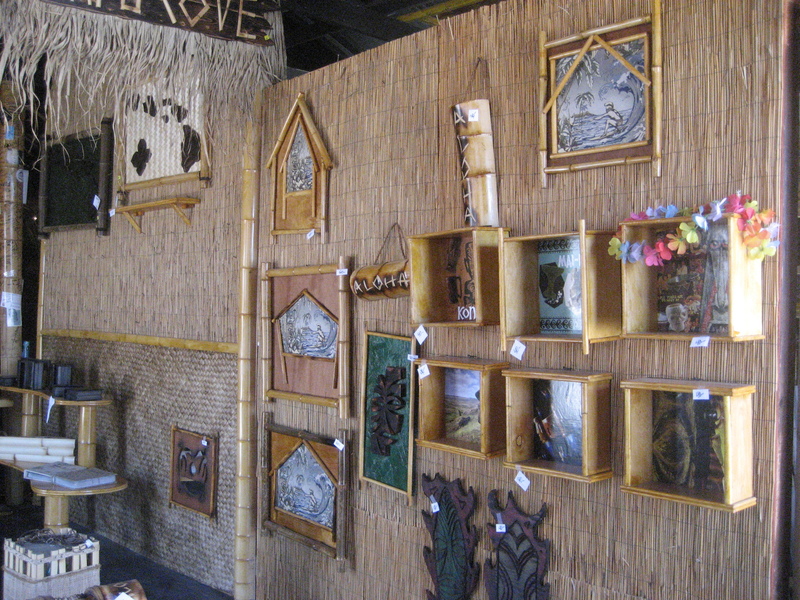 And in true beachcomber style, Ben often uses the bamboo and lauhala matting leftover from tiki bars and other installations (and also aloha shirts as in the pic above) to make frames and affordable art objects for purchase. 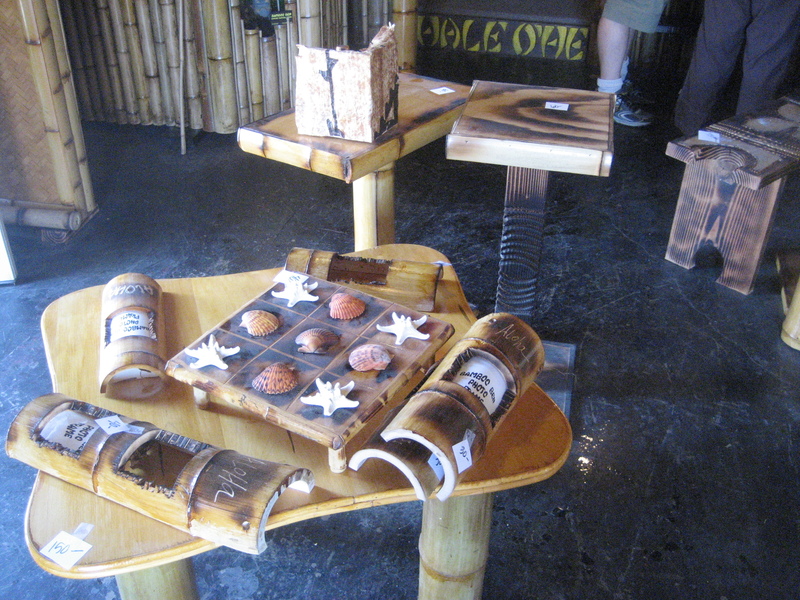 They’re not pictured here, but for my own tiki room we bought a bamboo mug shelf, two lamps and a few bamboo frames. It was quite tempting to take home more but we only had so much room in the Prius. 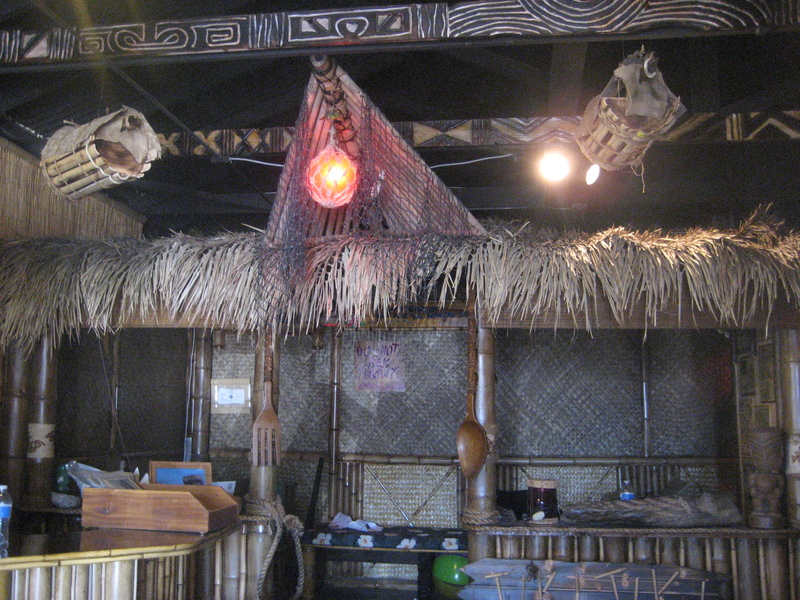 If he’s not too busy building the next awesome tiki bar of tomorrow, he’ll do custom work — tiki bars, signs, shelves, tables, basically whatever you can think of that can be constructed out of bamboo — or trick out a room in your house into something truly magical.